If you are only making smaller patterns and want to share them with other users on this site, you can use our free pattern maker. 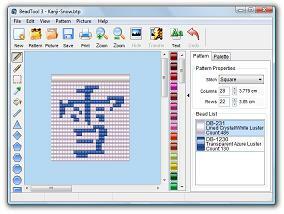 BeadTool4 is the best desktop program for patterns and you can get it from Beadtool.net. If you want to make patterns for cuffs, you need to select Peyote under the "Pattern Properties" column on the right of the program. Only the trial version of BeadTool is free. The full version is $49.95. In the trial version, you can make patterns but you can't save your files so it's very easy to accidentally press "new" and lose the entire pattern, so I strongly recommend that you invest in the full version. The full version also gives you the option to export and customize what the pattern looks like. Tall patterns can be hard to make, and may not fit on your forearm. I recommend that you use a maximum of 18 rows. The taller your pattern is (i.e. the more rows you have), the wider it will need to be (more columns). This is because our arms obviously get fatter as they go up. If the cuff goes to the middle of your forearm, but is only wide enough for your wrist, it will stretch out too much and not look as good. Here is a transparent PNG file that you can place over patterns made in BeadTool using a graphics program like Photoshop, Fireworks, or Paint Shop Pro. You will need to have your BeadTool image saved at the right size to use these. When you export your pattern (using the full version of the program), set the size to 21. This will make your exported pattern the same size as the ones on my site, so that you can use the overlay. Tip: if the numbers are hard to see, place a white background under both the overlay and your pattern, and then reduce the opacity of your pattern to fade it out. 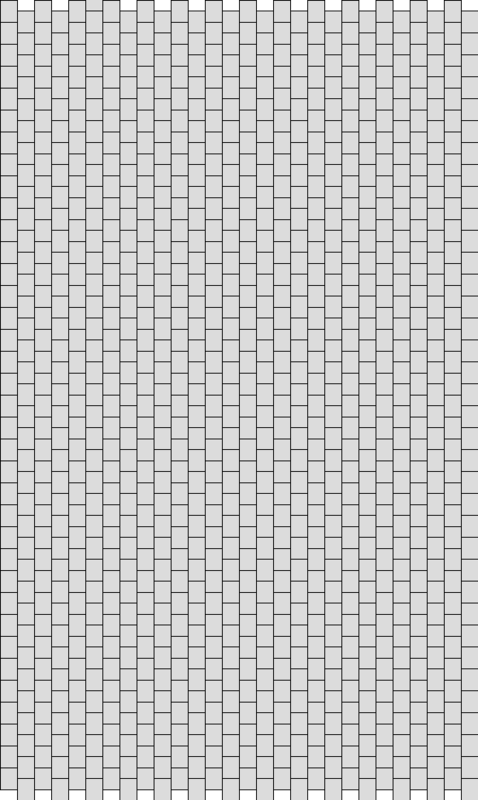 If you don't want to use a web app or program, you can download the blank kandi templates below. These are blank kandi patterns you can use for designing your own patterns. There are two sizes of layout: the first one (with the bigger boxes) is 32 columns across, and 18 rows up (or 25 rows up, depending on how you count). The second one (with the smaller boxes) is 48 columns across, and 22 rows up (or 43 rows up, depending on how you count). If you want to color the blank pattern in on the computer, using a graphics program like Paint, you should download the GIF version. If you want to print the pattern out and color it in on paper, you should download the PDF version. You are free to do whatever you want with patterns that you make with these blank templates, but you must not redistribute these anywhere. You can only link to this page. To download, click on the icons, not the previews. Be sure that when you use these, you color in an EVEN number of columns.